As the weather warms up, we yearn to cast off the shackles of winter hibernation and once again feel the joys of outdoor liberation. 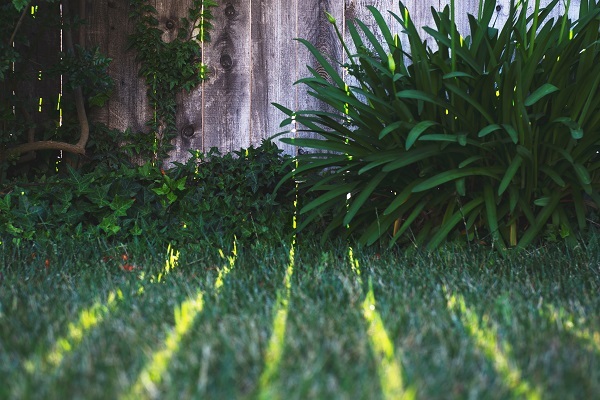 That begs the question: Is your outdoor space ready to live up to your warm-weather dreams? If not, now is the time to wake up your outdoor space and make it a place you will love to live. Read on to discover five ideas to get you on track for outdoor greatness! 1. Weeding and cleanup: Necessary? Yes. Enjoyable? Puhleeze! If you enjoy weeding and cleaning, call me. I have a yard that will make you ecstatic. Ugh. But…I will follow my own advice because I know what a difference it makes getting rid of dead weeds, unruly grass, and plants that didn’t survive the cold. You’ll want to take stock of your pots, plant stands, and outdoor shelving to ensure they’re in good shape and ready for use. A little paint or spray paint usually does the trick and costs very little. Repurpose, repurpose, repurpose! And while you’re in paint mode, don’t forget to touch up fencing and other trim. For a finishing touch, add river rock or colored mulch to flower beds. 2. Furniture face-lift: It’s a safe bet that your outdoor furniture—whether stored inside or out—is looking a little worse for wear. And have you seen the price of patio furniture lately? Gulp! To stretch your budget and get another year or two of service from your outdoor furniture, go back to the paint. (Michele’s rules for life: When in doubt, paint.) 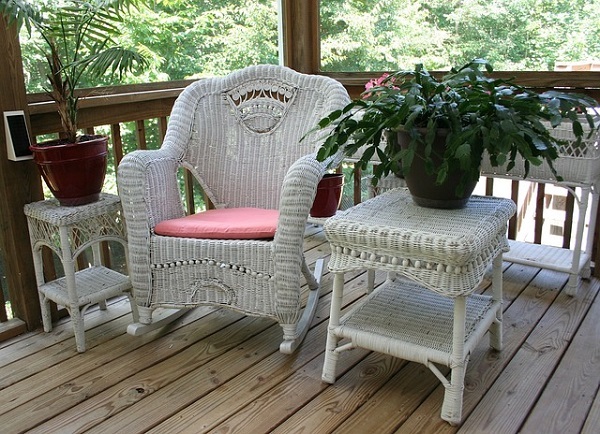 While painting metal and wicker furnishings can be tricky, spray paint makes it a treat. Shake up a can and you’ll be well on your way to stretching your budget and crafting a great outdoor look—especially if you kick in for updated outdoor cushions when they’re on sale. Fresh colored cushions can create a splashy new look. Got some remaining tax refund funds? You could splurge on an umbrella or two to add beauty and comfort. It’s well worth it to shop for the highest quality you can afford on your budget. Choose a too-cheap umbrella and the sun will fry it by the Fourth of July. TIP: Make sure to prep well for any outdoor painting. Remove cobwebs and dirt first so you won’t be disappointed with your results later. 3. Plants and flowers: What a natural, affordable way to add color and interest to any outdoor area! Placed strategically along a fence line, plants and flowers may also provide privacy from your nosy neighbor. You’ll find options at practically any price. Hit the sales and stretch your dollars, and make sure to do your homework on matching your selections to your sun and shade conditions. One of the best things about this step is that it can fit about any budget. Read the tags on the plants! If you make wise choices and your plant dies, know that the big box stores will typically refund your purchase if you have the receipt. 4. Lighting: Just like an indoor space, plan your lighting to match your activities. Do you like to eat dinner, play board games or throw parties outdoors? If so, the contractor-grade globe light above your patio door ain’t gonna cut it. We are living in a golden age of affordable solar lights for almost any purpose. Have fun selecting the style you like that sets the mood you desire. And don’t forget to check carefully for any electrical requirements. A classy, charming look can be had by adding solar-powered pathway lights in your flower beds or along the perimeter of your yard. Super affordable and versatile, these lights will make you want to stay out and linger in the peaceful stillness…that is until the gnats envelop your noggin, or a particularly nasty dragonfly puts you in its cross-hairs. 5. Adding or repairing structures: This is a big one and not something you would tackle every year, but worth your consideration. If you don’t have a patio, deck, pergola, pavers, fire pit, spa or cabana in your yard, these types of additions can be valuable investments to turn your yard into a genuine living space during the warmer months. If you have the skills or want to develop them, choose the DIY route instead of hiring a pro. If you already have one or more of these structures but they’re looking shabby, get out those paint brushes or sprayers to help restore their glory. TIP: A terrific way to add new life to an otherwise boring patio or pool deck is with concrete stain or texture. Not a bad DIY project if you’re willing to use a little elbow grease and spend some time on your hands and knees. Check your home improvement stores and ask for help to find the finish that’s right for your space. If you’re doing a big area, you’ll typically save by buying the five-gallon instead of the one-gallon size. I hope this blog helps motivate you to make the most of your outdoor opportunities. There’s nothing like a morning cup of coffee in a beautiful outdoor space to set the mood for a glorious day!